Rene Martucci has worked out of Davis as a musician and artist for the last 40 years. She won awards and was an outstanding student at Davis High School and UCD. She has been sculpting the dog as her subject for thirty years and she was very fortunate to collaborate with her sponsor City council member Rochelle Swanson in doing a tribute to Rochelle’s aging dog which is sculpted almost life size on the front of the bench. Martucci used tile and a lot of hand sculpted and hand fired pieces to give it a three dimensional quality. 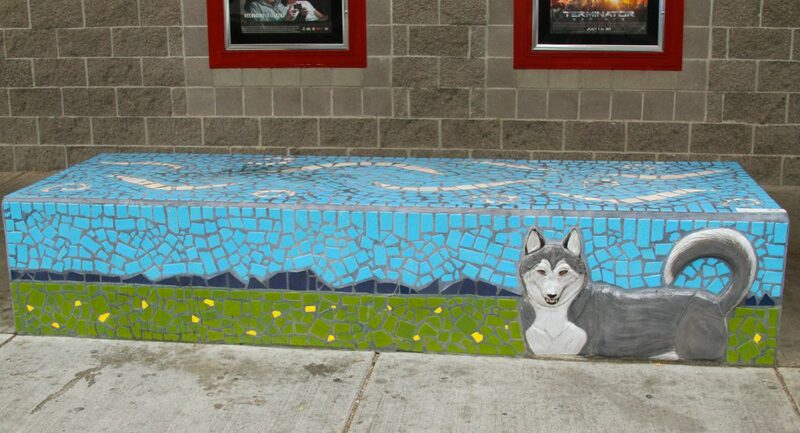 This is an incredible bench that again was made out of the existing city planters and today hundreds of people sit on it waiting for the movies.